]Abu Rahmah was released this evening, after having served the 16 months sentence imposed on him by the Israeli Military Court of Appeals for organizing demonstrations. Abu Rahmah was received by his family, friends and supporters at the prison’s gate and vowed to continue the struggle. After much delay, Abu Rahmah who was supposed to have already been released yesterday, was finally released from the Ofer Military Prison this evening. He was received by hundreds who waited for him at the prison’s gate. Abu Rahmah, who during his trial was declared a human rights defender by the EU and a prisoner of conscious by Amnesty International, vowed to continue struggling against the Occupation, despite his unjust imprisonment and the six-months suspended sentence still imposed on him. He said, “On my release, I have no intention to go back home and sit there idly. In fact, by imprisoning me they have silenced me long enough. Our cause is just, it is one striving for freedom and equality, and I intend to continue fighting for it just as I have before”. 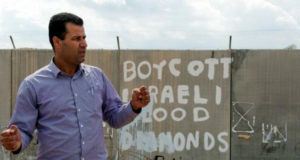 Abu Rahmah, the coordinator of the Bil’in Popular Committee Against the Wall and Settlements, was arrested last year by soldiers who raided his home at the middle of the night and was subsequently indicted before an Israeli military court on unsubstantiated charges that included stone-throwing and arms possession. Abu Rahmah was cleared of both the stone-throwing and arms possession charges, but convicted of organizing illegal demonstrations and incitement. An exemplary case of mal-use of the Israeli military legal system in the West Bank for the purpose of silencing legitimate political dissent, Abu Rahmah’s conviction was subject to harsh international criticism. The EU foreign policy chief, Catherine Ashton, expressed her deep concern “that the possible imprisonment of Mr Abu Rahma is intended to prevent him and other Palestinians from exercising their legitimate right to protest[…]”, after EU diplomats attended all hearings in Abu Rahmah’s case. Ashton’s statement was followed by one from the Spanish Parliament. Renowned South African human right activist, Archbishop Desmond Tutu, called on Israel to overturn Abu Rahmah’s conviction on behalf of the Elders, a group of international public figures noted as elder statesmen, peace activists, and human rights advocates, brought together by Nelson Mandela. Members of the Elders, including Tutu, have met with Abu Rahmah on their visit to Bil’in prior to his arrest. 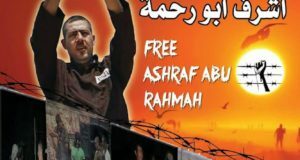 International human rights organization Amnesty International condemned Abu Rahmah’s conviction as an assault on the right to freedom of expression, and declared him a prisoner of conscious. Human Rights Watch denounced the conviction as well, pronouncing the whole process “an unfair trial”. 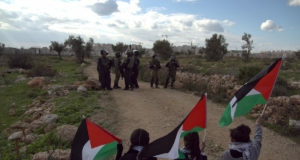 Israeli human rights organizations also criticized the conviction – including statements by B’Tselem, which raises the issue of questionable testimonies by minors used to convict Abu Rahmah, and The Association for Civil Rights in Israel (ACRI) which highlights the impossibility of organizing legal demonstrations for Palestinians in the West Bank. Abu Rahmah, the coordinator of the Bil’in Popular Committee Against the Wall and Settlements, was acquitted of two out of the four charges brought against him in the indictment – stone-throwing and a ridiculous and vindictive arms possession charge. According to the indictment, Abu Rahmah collected used tear-gas projectiles and bullet casings shot at demonstrators, with the intention of exhibiting them to show the violence used against demonstrators. This absurd charge is a clear example of how eager the military prosecution is to use legal procedures as a tool to silence and smear unarmed dissent. The court did, however, find Abu Rahmah guilty of two of the most draconian anti-free speech articles in military legislation: incitement, and organizing and participating in illegal demonstrations. It did so based only on testimonies of minors who were arrested in the middle of the night and denied their right to legal counsel, and despite acknowledging significant ills in their questioning. The court was also undeterred by the fact that the prosecution failed to provide any concrete evidence implicating Abu Rahmah in any way, despite the fact that all demonstrations in Bil’in are systematically filmed by the army. Under military law, incitement is defined as “The attempt, verbally or otherwise, to influence public opinion in the Area in a way that may disturb the public peace or public order” (section 7(a) of the Order Concerning Prohibition of Activities of Incitement and Hostile Propaganda (no.101), 1967), and carries a 10 years maximal sentence.